London-born, Miami-based Tom Scicluna explores the economic, spatial, and functional aspects of architecture by enacting three “performative gestures.” Together they point toward the volatile economic value of the site where Miami Beach Urban Studios Gallery is located: Lincoln Road, a pedestrian mall of a plethora of restaurants and shops. The works also consider The Urban Studios as a flex-space for the seven departments that make up Florida International University’s The College of Architecture + The Arts (CARTA). In this artist book are photographs relating to Concrete Foot I and II, images of which appear on the upper left-hand and right-hand corners, respectively, of most spreads; and Concrete Foot III, images of which appear on the front and back covers of the catalog. The variable sculpture Concrete Foot I consists of the number of generic 12” by 12” pavers Scicluna could procure for $300, the rental rate/square foot of storefront property along Lincoln Road at the time of the exhibition. Each weekday, Scicluna spatially re-configured the pavers to serve as pedestals for construction material found outside of the 420 building or furniture found at The Urban Studios, or as seating platforms for meetings, performances, and audiences. 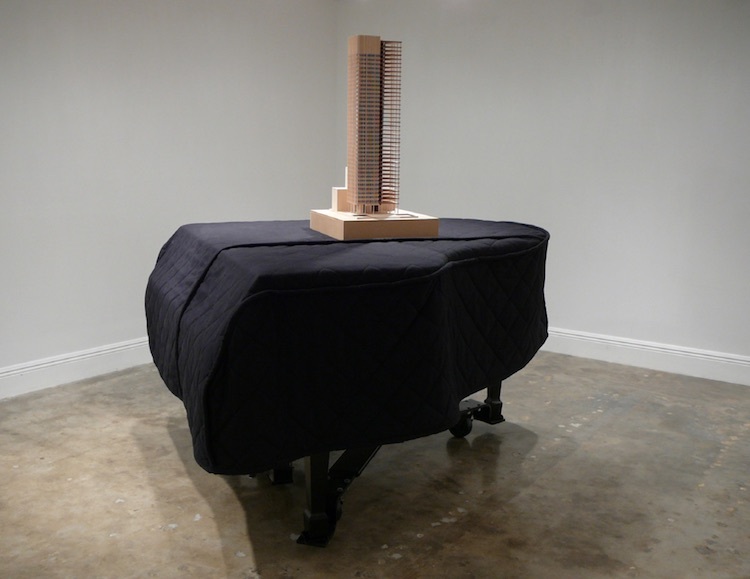 Concrete Foot II incorporates a piano, which is typically part of performances by musicians and music students that take place at MBUS Gallery. 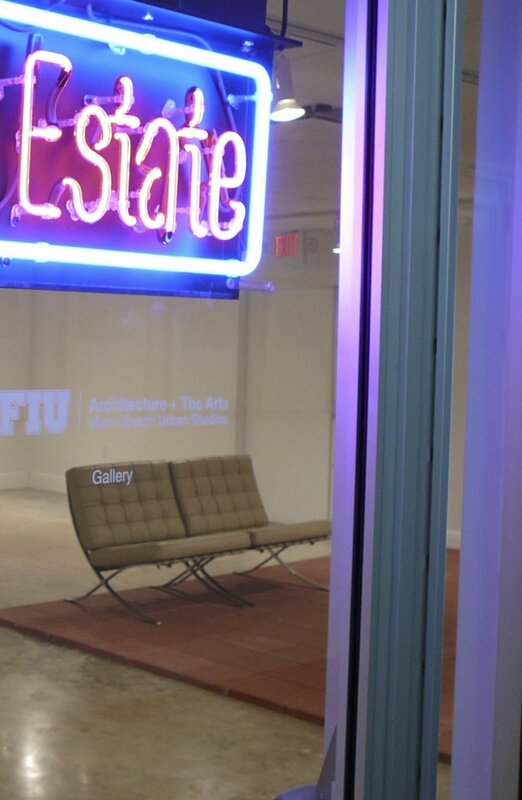 This work functioned as a “pedestal” of sorts for a rotating exhibit of architectural models created by FIU students in the architecture program at the Urban Studios. Finally, Concrete Foot III is the real estate neon sign installed at the entrance/exit of the gallery. As an ironic comment upon commercialism and reuse, the piece was returned after the exhibition for a full refund from the store where it was purchased. An abecedarius of short texts further contextualizing Scicluna’s works will accompany this volume. This artist book, though, is largely free of text—the emphasis is on the visual as knowledge in its own right.